What’s Up With our Grave Robber Spray!? Gratefully we are almost through the “cold and flu season”, I hope that it was a non-event for you. 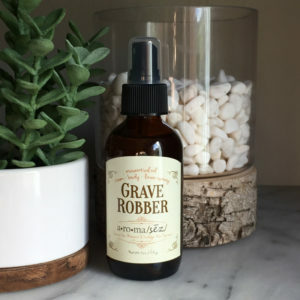 Grave Robber spray is one of my favorite combinations of essential oils and I spray it generously all over the house to keep us healthy and smelling fresh and clean, even while the windows are closed. You might be wondering what the Grave Robber spray is and where it’s name came from. While there are a few versions of the story they all center around one event, the 15th Century Bubonic Plague. It is said that, during that time, four thieves went from house to house to rob those who had succumbed to the illness. After the thieves were captured and tried for their acts of robbery, a judge offered leniency if they would share how they were able to be around those afflicted long and often enough to rob them but not be affected by the illness. It’s interesting to note here that, during this time of the plague striking Europe, physicians were seen wearing long black robes, wide brimmed hats, and masks that appeared to have a beak. The reason for doing this is that the masks were said to have contained a combination of herbs, spices, and essential oils that the physicians would breathe in order to keep themselves safe from those afflicted with the illness. Their long black robes were also said to be doused in a similar fragrant concoction and current research continues to build upon this theory. What we do know is that this powerful combination of clove, lemon, cinnamon bark, eucalyptus, and rosemary have been found to be strong enough to reduce bacterial cultures by 99.96%! This blend was created after years of research results indicated that most viruses, fungi, and bacteria cannot live in the presence of some essential oils. This is an amazing spray that I highly recommend all year. To your health, with love. I was in Italy last year and saw these robes, hats and cones in a little local museum but had no idea why/how they were medically used. Thank you for your explanation! How neat! I would love to see that!